The Niagara Falls Review has a great article about with some great photos of Jay Cochrane and Henry Rechatin, both of whom passed away last year. The world of tightrope walkers lost two of its giants in 2013 – Jay Cochrane and Henry Rechatin. Cochrane, who was born in 1944 and dubbed himself as “The Prince of the Air,” died from pancreatic cancer on Oct. 30. He was 69. Rechatin, the legendary French tightrope walker and chair-balancer who was known as Henry’s, died on Dec. 27. He was 82. Both men had plans to walk across Niagara Falls on a tightrope, but unlike Nik Wallenda who did it on June 15, 2012, they were never able to get permission from the authorities on both sides of the border. Jay Cochrane came before City politicians Tuesday night bearing gifts for the Tender Wishes Foundation, the Boys and Girls Club of Niagara and the City. The 68-year-old funambulist raised more than $10,000 to be split evenly between the two organizations. Spend your End-of-Summer Holidays on Clifton Hill! 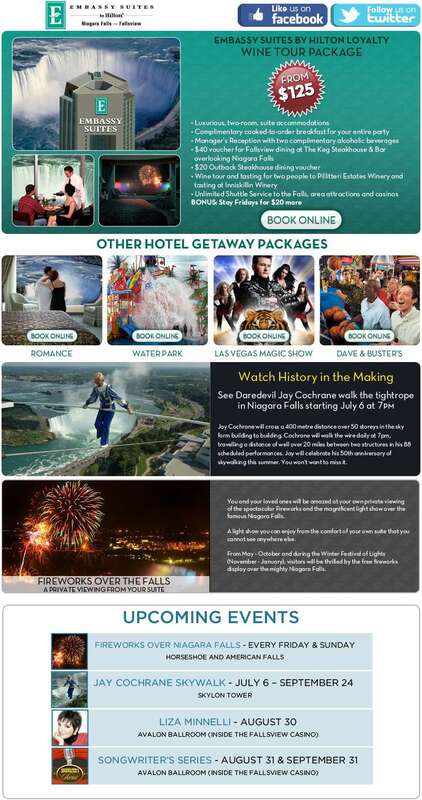 Exciting Summer Events in Niagara! 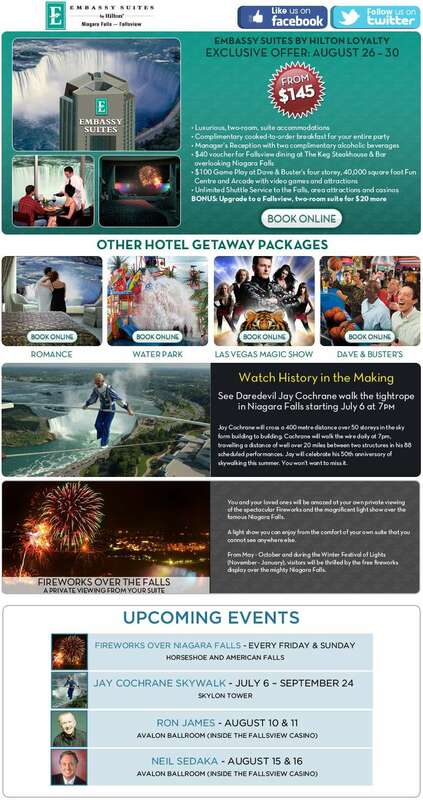 Last week I received the latest newsletter from NiagaraFallsBestHotels.com (the Fallsview Group). I haven’t had a chance yet to see Jay Cochrane walk the wire from the Skylon Tower to the Hilton Fallsview tower. I’ve seen him before and thought it was an excellent show. Apparently there are a couple of great ways to see the walk. The first is to be there in person. 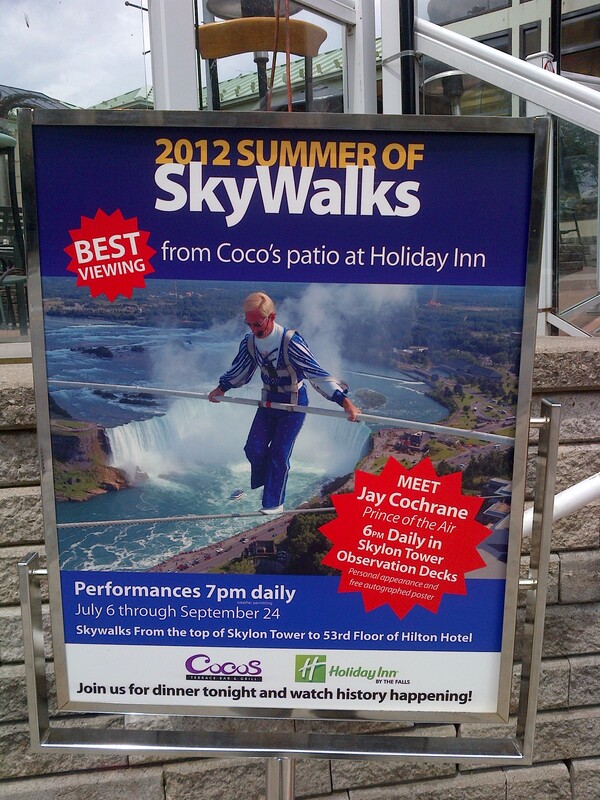 You can pay for your regular admission up the Skylon Tower and you will see him walk. There are signs around the property indicating this, as well as the fact that you can see him in person just before the walk. The other way is from the Skywalk 2012 web site. The Hilton has a webcam and you can view the walk. Cool! The Summer of Death Defying Men! A couple of weeks ago I received an email newsletter from the Clifton Hill Resort. I haven’t had a chance to see Jay Cochrane walk yet this year, but I’d like to.